The Irish voters' rejection of the renamed EU constitution, the Lisbon Treaty, on June 12 2008 was a victory for democracy in Europe. Working people voted 'No' because Lisbon represents a direct attack on their hard-won democracy and decent public services and creates the conditions for a race to the bottom in wages and conditions. Trade unionists across Europe have seen what the treaty promises with a number of recent judgments from the European Court of Justice effectively outlawing strike action. The ECJ, a core EU institution, has ruled in the Viking, Laval, Ruffert and Luxembourg cases that, in different ways, business rights trump trade union rights to take industrial action and bargain collectively for their members. Highly political ECJ rulings are also being used to open up health services to competition and to create a single market for health care across the EU, which would have huge implications for the National Health Service. Under the Lisbon treaty, the ECJ would become the supreme court of the EU over and above national courts and would have the power to act like the US supreme court. As one of the architects of the EU project Jean Monnet said back in December 1952 at the inaugural meeting of the first EU court: "I greet you not only as the Court of the European Coal and Steel Community but also as the precursor of a Supreme European Federal Court". To make this a reality Lisbon is the first treaty to enshrine the superiority of European law over the law of its member states by referring in Declaration 17 to the primacy of ECJ case-law. Over the years this court has already asserted the superiority of EU law, its direct effect on member states regardless of national parliaments and the constitutional character of the legal order from which European law emanates. One ECJ judge once characterised the ECJ as "a court with a mission" - that mission being to extend the powers of the EU as widely as possible by means of the case law of a court that is notorious for "competency creep". If Lisbon comes into being, the Council of Ministers would no longer be an intergovernmental body responsible to their national governments but, instead, an EU government in its own right. The European Commission would become the executive in this new set up, charged with drawing up and implementing EU law. And if either of these unelected bodies do not further EU goals as laid down in the treaty they could be taken to the ECJ which would take decisions on the basis of deepening the EU without a democratic mandate. The Lisbon Treaty would also make the EU Charter of Fundamental Rights legally binding on the member states and their citizens in all areas of European law. 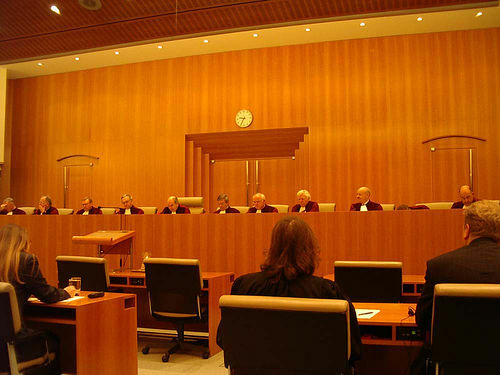 This would give the 27 ECJ judges in Luxembourg the final decision on the wide range of human rights issues covered by the Charter, as against national constitutions and Supreme Courts or the European Court of Human Rights (ECHR) in Strasbourg which is not an EU body. The ECHR makes its rulings based on the European Convention on Human Rights alone. It does not have to take account of other rights in the EU treaties, such as business right to 'freedom of establishment', in the way the ECJ does. However, the ECJ has legal power to enforce its rulings on EU member states, whereas the ECHR does not. Some trade unionists have supported the Charter of Fundamental Rights in the mistaken belief that it would strengthen their rights to collective bargaining and strike action, thinking that European law would override national law in such areas to their advantage. However, the new treaty provides that the Charter is to be interpreted in the light of the Explanations which state that "the modalities and limits for the exercise of collective action, including strike action, come under national law and practices". Moreover, the exercise of the rights and freedoms recognised by the Charter may be limited "to meet objectives of general interest recognised by the Union". In the Kjell Karlsson case, the ECJ also claimed: "it is well established in the case law of the Court that restrictions may be imposed on the exercise of fundamental rights, in particular in the context of a common organisation of the market". It is clear from these precedents that these "fundamental rights" are not fundamental at all but could be varied or restricted in the interests of a "common organisation of the market" or to advance "objectives of general interest pursued by the Community". In this post-democratic nightmare, the market becomes in effect the substitute for democracy, and human rights become marketised. Giving unaccountable euro-judges the final competence to decide our rights over the large area of public policy covered by the EU is more about power than rights. Human rights standards in the EU member states are not so defective that they require a supranational EU court - heavily influenced by corporate power - to lay down laws on over 500 million people. In fact, it is often the other way round as recent ECJ cases have shown. It is generally agreed that recent ECJ rulings have already found in favour of business interests. The illegal imposition of the discredited Lisbon Treaty would make matters considerably worse and should be resisted by all democrats and trade unionists. Also see the full text of the pamphlet "Social Europe is a Con" which has sections dealing with ECJ rulings on Viking and Laval, also Mode 4. This is available here in pdf format.